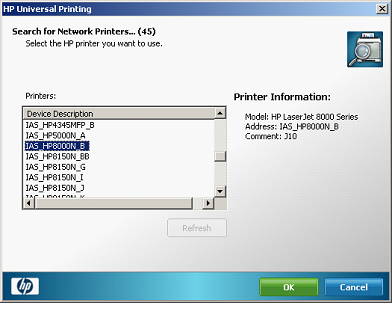 Note – Only HP printers are supported by the HP Universal Printer software. 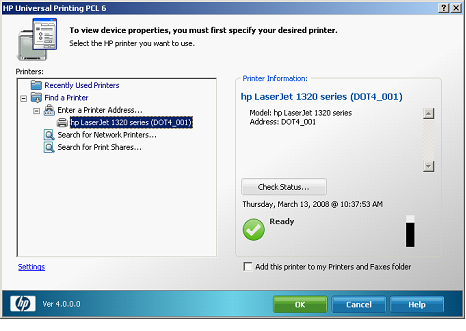 Not all features (such as browsing for device name) are available on all printer models. The HP Universal Printer allows users to search for and add new printers. 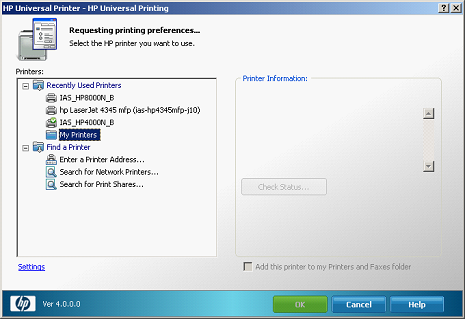 A standard user is not allowed to install printers, but the HP Universal Printer acts like a local printer and allows standard users to find and print to new printers. 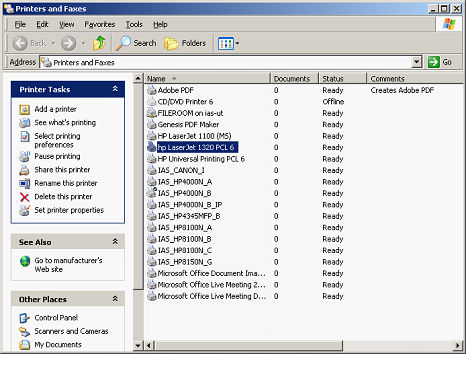 Open the Printers and Faxes folder by going to Start – Settings – Printers and Faxes. 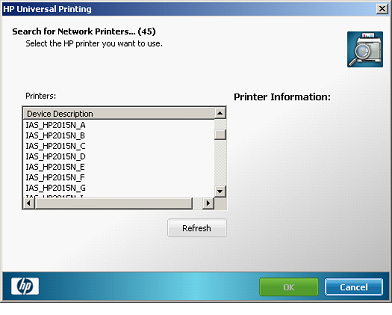 The HP Universal Printer is listed along with the rest of the installed printers. 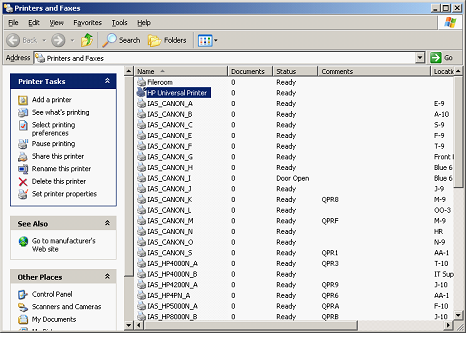 In order to print a document using the Universal Printer software, you must first select a physical print device with which the software can communicate. This is done through the Properties of the printer, which is accessed by right-clicking on the HP Universal Printer and selecting Properties. Or you Double-Click on HP Universal Printer to open the printer. Then select Properties from the Printer menu item to open the HP Universal Printer Properties page. This is the page you will use to find and manage printers. Click OK to add the printer. To save the printer for future use, right-click on the printer, choose Move to Folder then choose Recently Used Printers, New Folder, or any other folder you have defined. The printer is now saved in the folder you chose. In order to search for network printers, the JetDirect card must support mDNS (aka Bonjour) so you may need to upgrade the JetDirect firmware. The default mDNS name is the model of the printer so I suggest you change it to your naming standards. Open the Universal Printer Properties page. Click on Search for Network Printers and you will see a list of available printers. Scroll down to find the printer name. 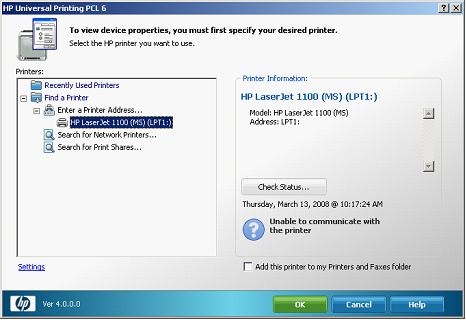 Select the printer in order to view information about the printer, such a model and port address. The location of the printer will be listed in the Comment field if supported by that model. Choose the printer and click OK to add the printer. Right Click the printer and choose Move to Folder to save the printer for future use. You may choose the Recently Used Printers folder or any other folder you have defined. The printer is now saved and ready for later use. You may also add shared desktop printers to your printers list. 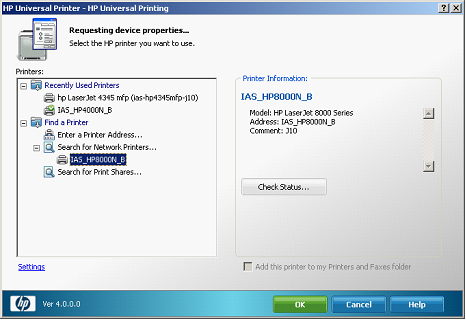 Open the HP Universal Printer properties page. 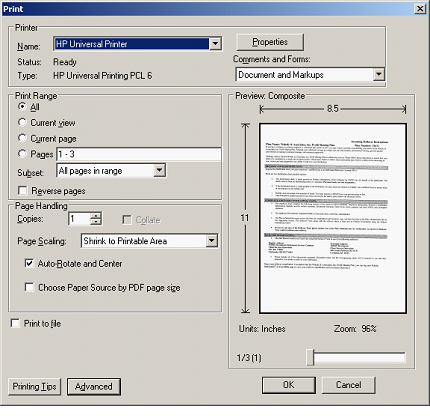 Select Search for Print Shares. You will need to enter the shared printer name by its Universal Naming Convention (UNC) name. These names are formatted \\computername\sharename so you will need to know the name of the computer to which the printer is connected. Click on Ok to save the printer. You may also save this printer to a folder for future use. 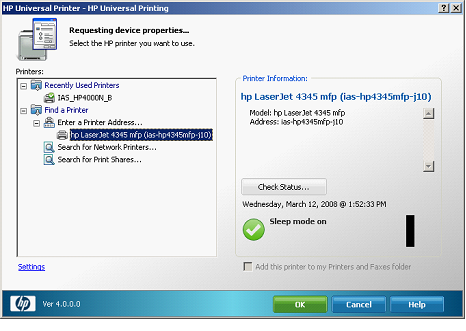 You may also add a locally attached printer (if you have one installed) to the list of printers in the HP Universal Printer software. Under Find a Printer, select Enter a Printer Address. The printer is now installed and can be saved to the Recently Used Printers folder or another folder of your choosing. If the local printer is connected with a USB cable, you will first have to find the name of the port. Open the Printers and Faxes folder and locate the local printer you want to add. DOT4_001 is the port name in this case. You may move the printer to a folder to save it for later use. Click on the Settings link in the lower left corner to open the Settings page. The General tab allows you to change how the Universal Printer responds to printing requests from applications. If you prefer to print to different printers from different programs, choose Only prompt the first time a job is printed from an application. This allows you to print merge documents to one printer and screen prints to another printer. 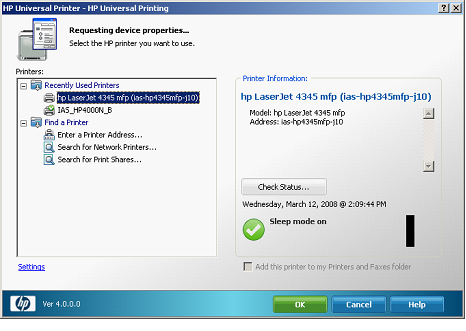 If you print to the same printer all the time, choose Only prompt if the last known printer is no longer available. 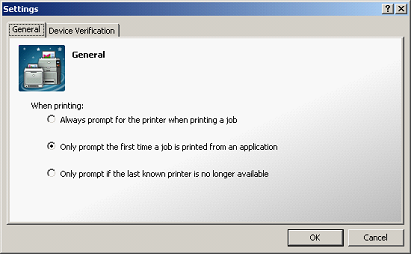 Since not all features are supported by all printers, you may need to change the Device Verification settings to work with your preferred printer. If you add a shared desktop printer to the Universal Printer, you may need to change the Verification setting to the lowest level. When the HP Universal Printer is selected as the default printer, you can print to any printer you have already added. You may also add printers if necessary. 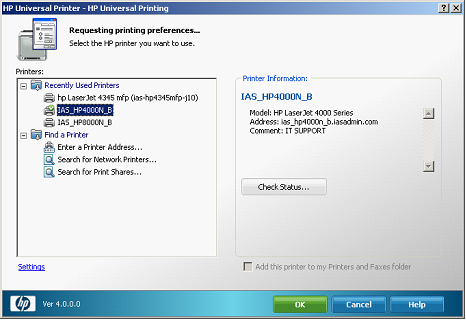 The IAS_HP4000N_B is the last printer used and is marked with a green check mark. When you select Print from a Word document, the Print menu will appear. The HP Universal Printer is listed as the default printer. The Where: field shows HST_ias_hp4000n_b.iasadmin.com and this is the physical print device that will be used. 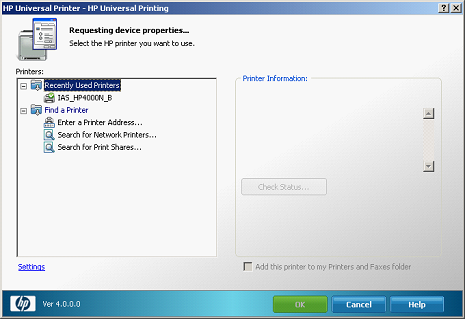 If you want to select a different physical print device, simply click on the Properties button next to HP Universal Printer. 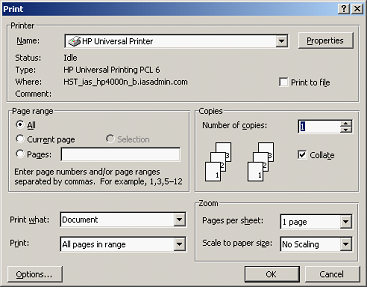 This will open the familiar HP Universal Printing properties page. You may select a different saved printer or add a new printer using the techniques covered earlier. The Printing menu in Acrobat Reader is different and does not show the physical print device. If you need to verify or change the physical print device, click on the Properties button next to the HP Universal Printer to launch the properties page. 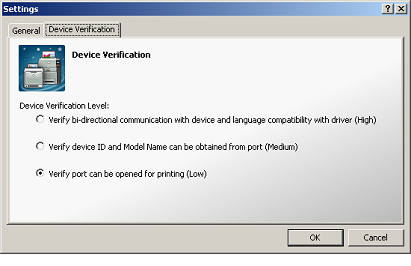 The print device with the green check mark is the currently selected print device. You may choose a different saved printer or add a new printer. You can create folders to manage your printers by right-clicking on Recently Used Printers in the HP Universal Printer properties page and choosing New Folder. You may also create a new folder when you choose Move to Folder – New Folder when saving a printer. Click OK to create the folder. The folder will be listed under Recently Used Printers. Ok, So do this on an x64 bit TS with users needing mapped HP printers. How? Have you ever tried ScrewDrivers? I personally have not, but friends have highly recommended it for terminal services environments. The printer is still managed locally on the workstation but all the settings are passed through to the terminal server without the need to install print drivers on the server. It’s supposed to be great for telecommuting implementations.